"I want to wake up in the city that doesn't sleep" sang Liza Minelli in the 1977 movie "New York, New York". Finally we were there. 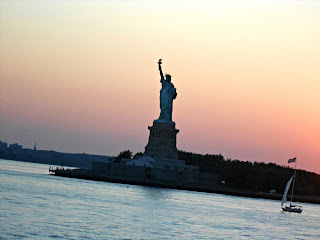 I have more than 50 first cousins from Dad's side of the family scattered around the world, 2 of them live in New York. The older one lives on Long Island, the younger one in Manhattan. Arriving at JFK Airport after an 1 1/2 hour flight from Toronto (or Te-ron-no, as my sister in law says it), we were met by the Long Island cousin and chaos. Chaos as a movie shoot was going on and our path to the baggage carousel was blocked by men and equipment. After living in hotels, it was good to stay with family. 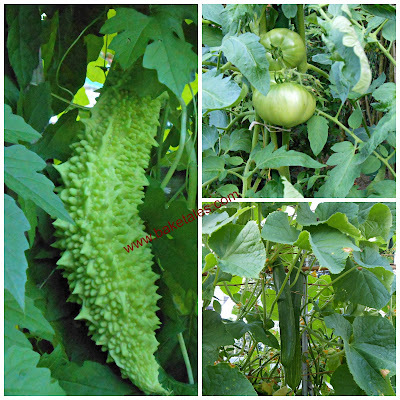 Most of the vegetables they cooked with came from that garden. We had been warned that New York was in the middle of a heatwave but for me, it was typical Chennai weather. Without the humidity. 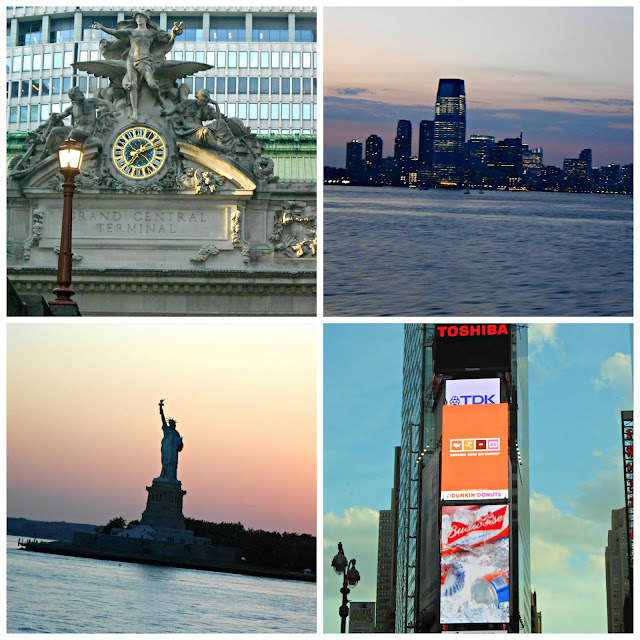 We had a bucket list of things to see and do in NY. Mine involved food. The younger cousin drove us into the city. It was just as the movies portray- iconic buildings, high end fashion retail outlets, food carts, people disappearing down subway stairs, people climbing up, the cabs, malls, billboards, tourists, street vendors, parks, bicycle stands... the hustle and bustle of life in maximum city. The next morning, we took a train into town and got off near the Lower East Side. 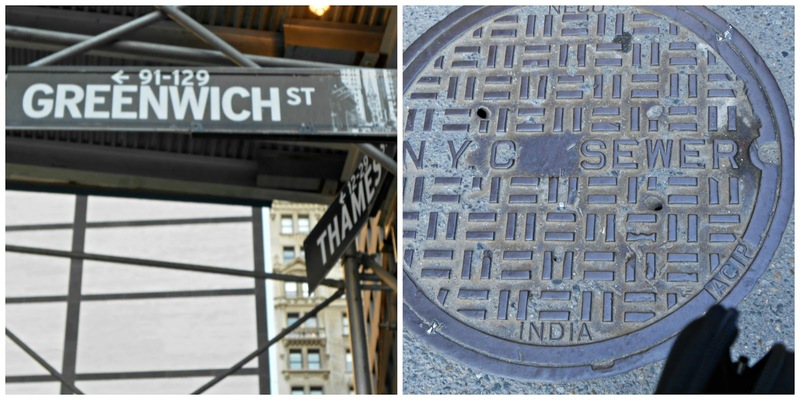 The Manhattan cousin met us and the term "pounding the streets of New York" became reality. We walked everywhere. 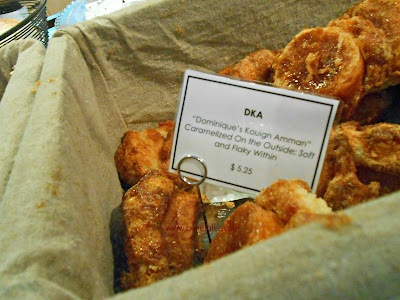 Our first stop was Dominique Ansel's bakery, he's the creator of the famous cronut- a cross between a croissant and a doughnut. Nope, no cronuts. Apparently, they bring it in every morning and it gets sold out almost at once. And the next delivery is only the next day! But we tried the DKA, aka Dominique's Kouign Amann aka queen amann- layers of flaky buttery pastry with a caramel shell and crunchy with sugar. Incredibly light and flaky, it was almost a sin to eat it. 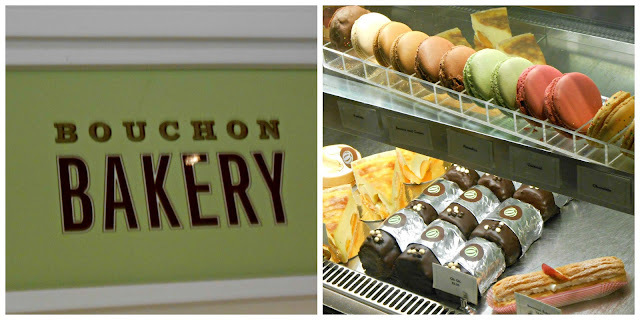 Hazelnut roll, macarons and steaming cappuccinos later, we were ready to walk some more. 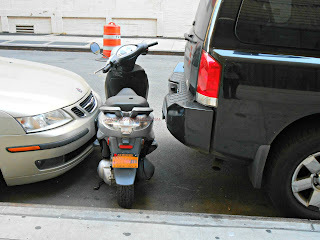 Or is there someone walking around NY with 4 cycle wheels?...Lol!! 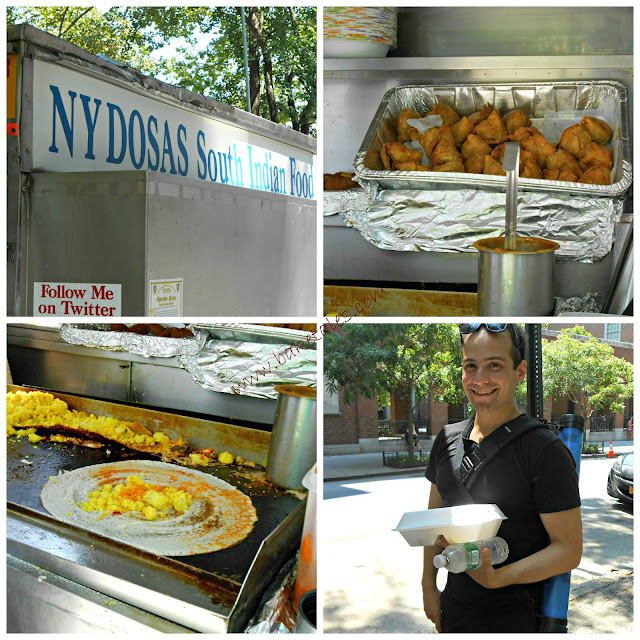 A dosa street stall! The guy operating it was from Sri Lanka, had been running it for about 7 years and had been winning awards for most of those years. We watched as he spread the batter into a thin disc, spread the chutney powder on, put on a scoop of the potato masala along with oil. When it was cooked and crisp, he folded it neatly and placed it in the takeaway box along with 2 chutneys. And handed it over to a very satisfied customer who told me that was his lunch most days of the week. A bit of shopping and sightseeing later, it was time for lunch. 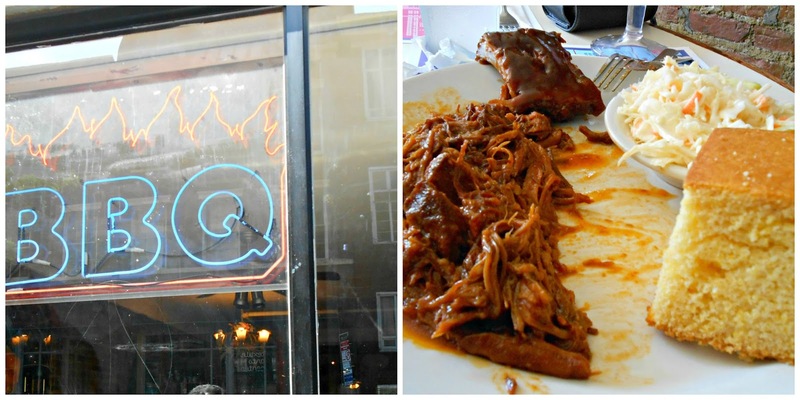 I've heard so much about pulled pork so we went into an aptly named BBQ restaurant. Pulled pork is pork that has been marinated and cooked slowly at a low temperature. The meat becomes so tender that it literally falls off the bone. It is then cooked with a barbecue sauce. Cornbread and coleslaw were served as sides. It was very tasty, a bit too heavy on the tomato though. The portion was enormous, thank goodness we were sharing a plate. François Payard is a French pastry chef and his bakery was on my must visit list. 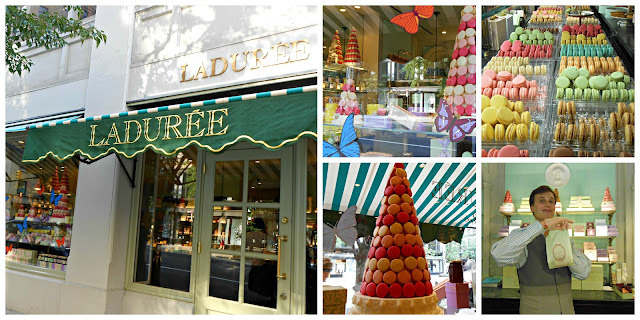 The glass display cases were filled with breads, macarons, rolls, tarts, flans, eclairs and other delightful sweet treats. 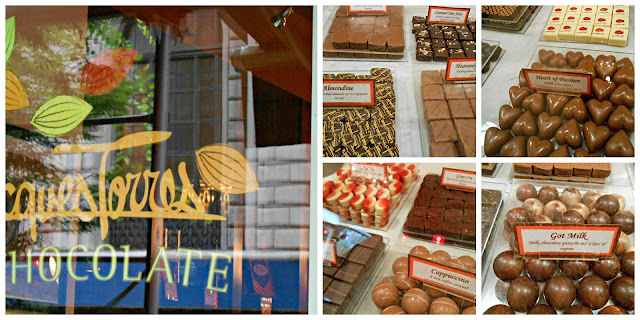 A couple of doors away was Jacques Torres' chocolate store. We were asked to try their chocolate milk shots. Rich, creamy and chocolate-y. Oh yummy! The next morning we walked around Lower Manhattan. This was the financial district, and where the twin towers used to be. Towering buildings on either side of the road, construction activity everywhere. We went into the Essex World Cafe, obviously very popular with the office crowd and construction crews working in the neighbourhood. 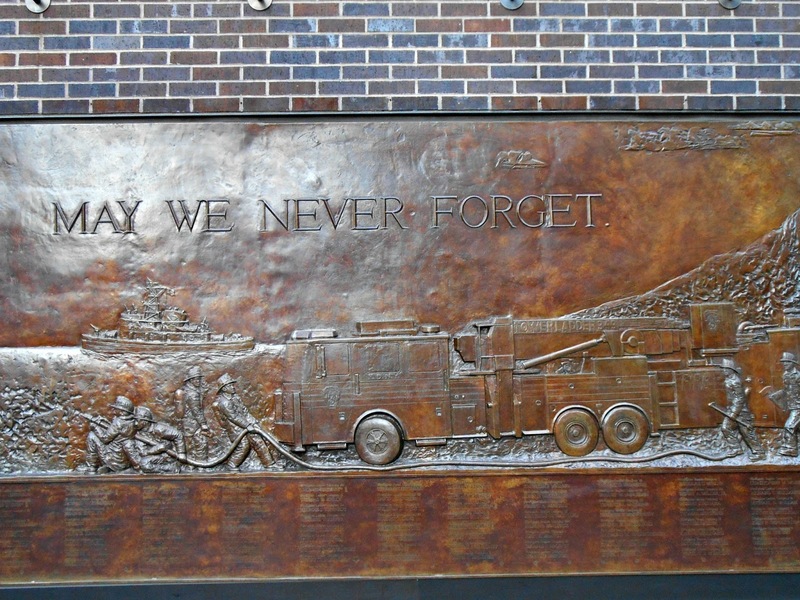 On the walls of the cafe were plaques, put up to honour those who had lost their lives that dreadful day. 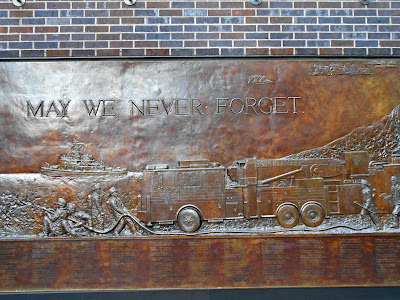 We walked into Ground Zero, where the twin towers once stood. It is now a park and two pools where the 2 towers once stood. The names of those who perished are inscribed along the edges of the pools. 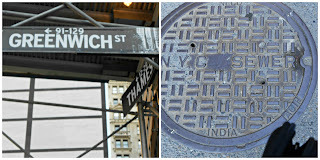 We walked out of Ground Zero and my cousin pointed out to something on the ground- a manhole cover made in India! We just had to go into macaron heaven Laduree and salivate at trays of macarons of all colours and flavours. 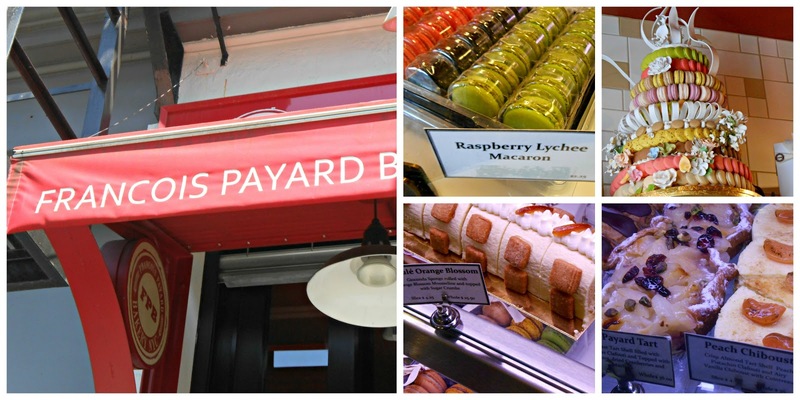 Our favorites were the ginger and the rose petal macarons. The selection we bought didn't last very long. We walked all the way to the ferry terminal and hopped onto a ferry for a ride to Staten Island. On the way, we passed Lady Liberty. It was sunset and the view was dramatic. When we reached the island, we had to disembark, rush round to the departure gate and catch another ferry back to the mainland. 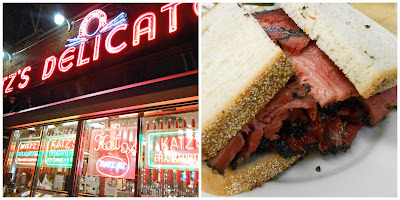 This was our last night in New York and we just could not go back without having dinner at Katz's Deli, famous for pastrami sandwiches and hot dogs. 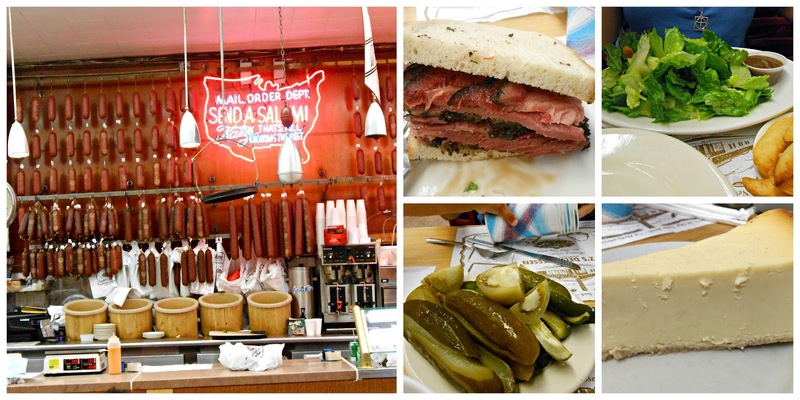 Several movies have been shot in this deli- perhaps this is a familiar one. 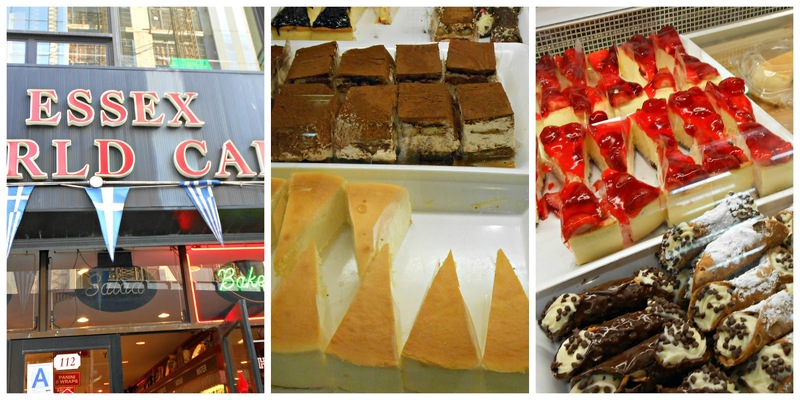 Where else but in New York can you have the best New York cheesecake? 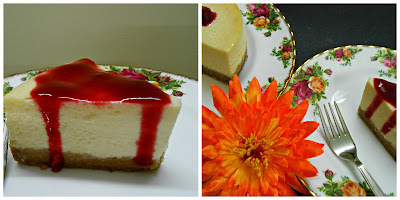 Typically, sour cream and cream cheese are important ingredients in a New York cheesecake. The cheesecake is baked and either served plain or with a topping.We opted to have our cheesecake without any topping. It was delicious- dense, smooth, creamy and tangy, a delectable end to a dream holiday. 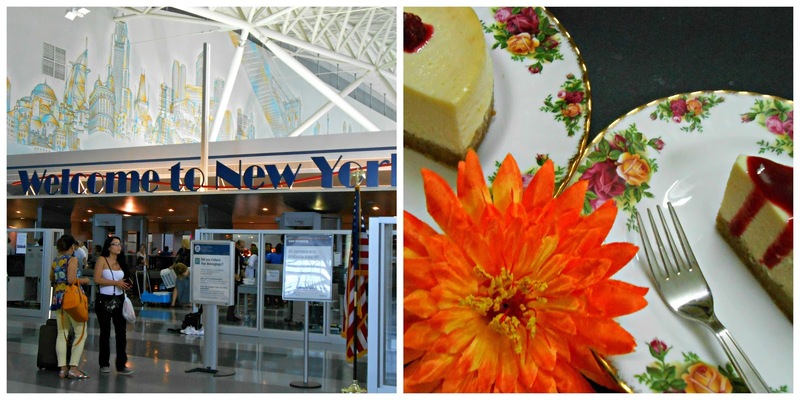 Here's my recipe for a New York style cheesecake. And a raspberry glaze, if you prefer yours with one. Lucky ducks who can lay hands on Philadelphia cream cheese, go for it. It makes a world of difference. If you are making your own sour cream, mix 2 teaspoons lime juice into the cream, stir well and keep aside. Combine ingredients for the crust, turn into a 6" pan with a removable base and pack tightly and evenly. Bake at 140°C for about 10 minutes or till lightly browned. Remove and cool. In another bowl, lightly beat the cream cheese and sugar till smooth. Blend in sour cream, eggs and vanilla extract, add a little lime juice if necessary. Add in the rind of half a lime. Place the pan on a large sheet of foil, bring the foil up the sides of the pan. Ensure that no water will seep in. Carefully pour the cheesecake mix over the crust, place in a larger pan of hot water and put it into the oven. Bake in a preheated 180°C oven for about 50 minutes or till the cheesecake has a slight wobble only in the centre. Remove from the oven, take the pan out of the larger pan, remove the foil. Allow it to cool to room temperature then put it in the fridge for at least 6 hours. Run a thin blade around the cheesecake and remove it from the pan. Set it on a serving plate, spread the glaze over or serve it separately. Thaw the berries in a small pan, sprinkle the sugar over and leave for about 15 minutes. Warm the berries over a gentle heat, allow it to just reach a boil. Remove from heat. Cool and mash with the back of a spoon, pass through a sieve to get a thick puree. Serve over slices of cheesecake. Hi Rajini, a baked cheesecake needs eggs to hold it all together, to give it structure. There are recipes for baked cheesecakes which use cornflour. Of course, the taste and texture will be different.